The world is moving rapidly in improving the understanding of genetic, biochemical, cognitive, behavioural, and environmental factors underlying anxiety and related disorders like depression. Further work, especially related to development of emotional health is needed. Many members of the CEH have interests in basic processes underpinning emotional distress. A key strength is our lifespan perspective and expertise in developmental processes. More focused and co-ordinated research directions may lead to stronger outputs. Strengthening our expertise in basic underlying processes in fields such as genetics, epigenetics, psychophysiology, and neuroscience would be beneficial and would position us well for future success with ARC and NHMRC funding. 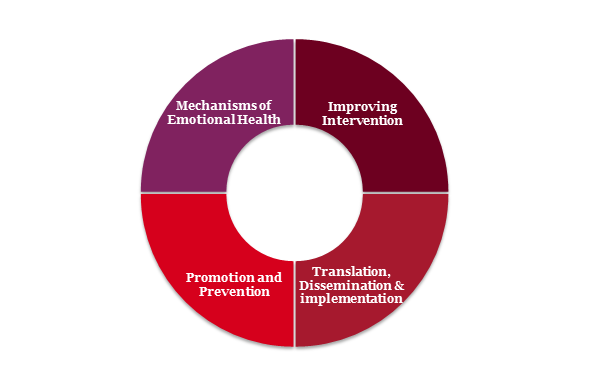 Over the next three years, our goal is to develop an improved understanding of the factors that relate to, predict and influence emotional health across the lifespan. While treatments for anxiety are broadly successful, not all individuals benefit and some are susceptible to relapse. In addition, treatments for some anxiety disorders, and for some co-occurring disorders do not have the same success rates as other anxiety disorders. Thus, many CEH researchers are invested in improving treatment outcomes in the short-term and in the long-term. Our research strives to develop and evaluate treatments tailored to the individual rather than a one size fits all approach. This work is intertwined with understanding the mechanisms underlying anxiety and related disorders as well as understanding the mechanisms of change underlying treatment. A key strength of the Centre is our translation of research findings into practice. Using knowledge from our research on mechanismsof emotional disorders, we develop and evaluate interventions designed to treat anxiety disorders and related difficulties. Our interventions are then made available to clients, families and health professionals, both within our clinic and broadly, by training health professionals around the world. Over the next few years we want to strengthen our efforts in three areas. First, we will improve access to services, particularly to those in rural or remote communities, by delivering our evidence-based programs online. Second, we will ensure the integrity of our services delivered in the community remains high by developing an accreditation process for the dissemination of CEH resources. We are committed to engaging health professionals and directing them towards evidence based practices. As always, we will evaluate our efforts in dissemination to examine effectiveness. Finally, we will endeavour to make the CEH clinic a sought-after resource for the community and a source of expert advice. Our goal is to improve our clinic service by ensuring our clinicians are of the highest quality and are fully briefed in evidence-based practice. One of our priorities in the Centre will be to increase public knowledge about emotional health across the life span and become a stronger voice in the media regarding the understanding, intervention and prevention of emotional health problems. Over the next few years, we will focus on improving the promotion of not only our research findings, but also on improving the promotion of emotional health of the community. Importantly, a key strength is our expertise in children’s emotional health. We believe building emotional health in childhood sets the stage for a healthy and productive life. Thus, if we can prevent anxiety disorders in young people, this will have a significant impact on individuals across the lifespan. Our Centre currently conducts a number of prevention trials, both at the universal and targeted level, aimed at reducing the prevalence of anxiety and related disorders across the lifespan. Over the next few years, we will use these data to prepare and submit reports to the government, outlining the benefits of intervention and prevention programs for emotional health problems across the lifespan. LEAD: Be a world-leader in emotional health research. COLLABORATE: Be the collaborator of choice for emotional health research. MENTOR: Prepare world-ready HDR candidates and early career researchers in emotional health. TRANSLATE: Deliver the highest quality, evidence-based service for the management of emotional health problems. TRAIN: Deliver specialised clinical and research training. COMMUNICATE: Improve public knowledge about emotional health across the lifespan.